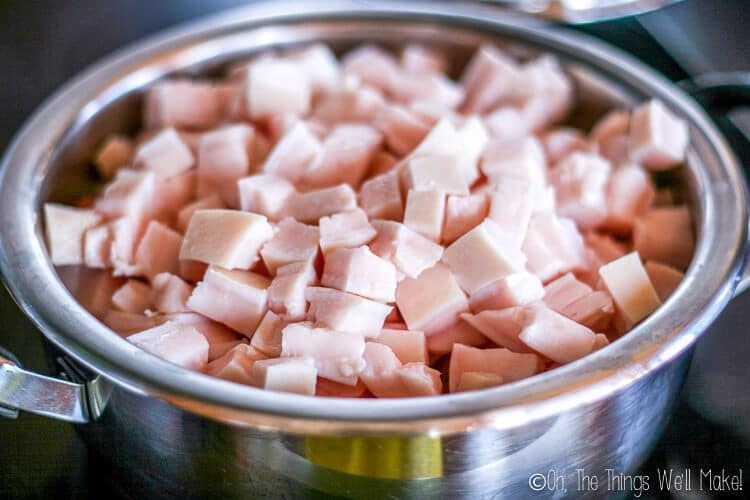 Rendering Lard: The What, Why, and How to Make Lard - Oh, The Things We'll Make! It isn't difficult to render lard. 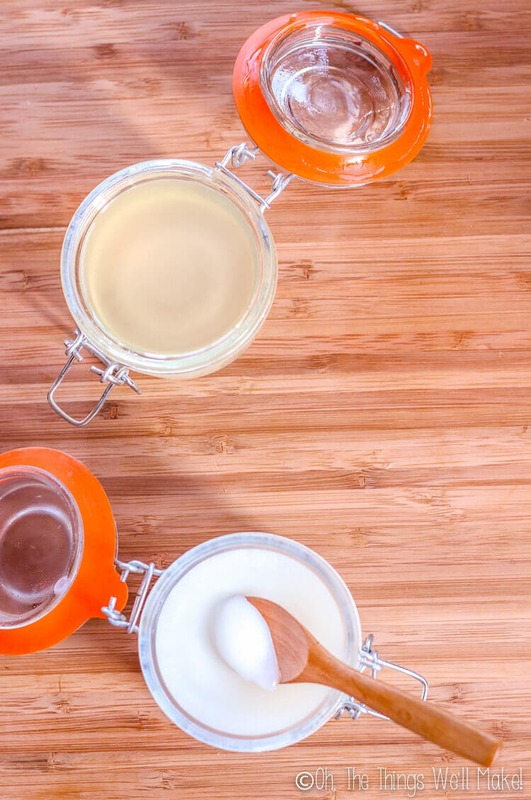 Learn how to make lard easily, either on the stovetop or in a slow cooker, and why you should. The definition of the word lard changes from source to source. It sometimes refers to the (unrendered) fat on the abdomen of a pig. Most people use the term, though, to describe the white fatty substance that has been rendered and clarified from pork fat. What does it mean to render a fat? Animal fat isn't just “fat” at all, but there is also water and protein in the composition that will make it spoil rather quickly. You can maybe store it in the fridge for a week or so, but it will go bad pretty quickly. 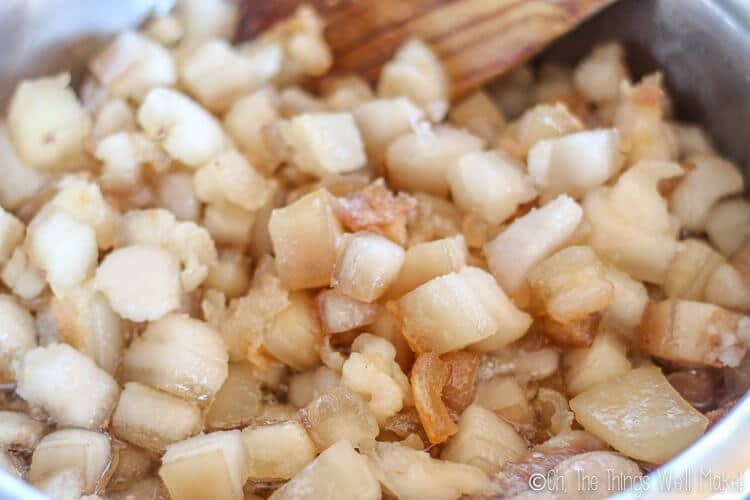 Many people find it tasty, and you can add pork fat to dishes like Valencian puchero, a Spanish stew that traditionally is made with a piece of pork fatback to give it flavor, and to be later mashed into the potatoes and sweet potatoes. Otherwise, though, there isn't a lot of use for pork fat, and it is often thrown away and wasted. 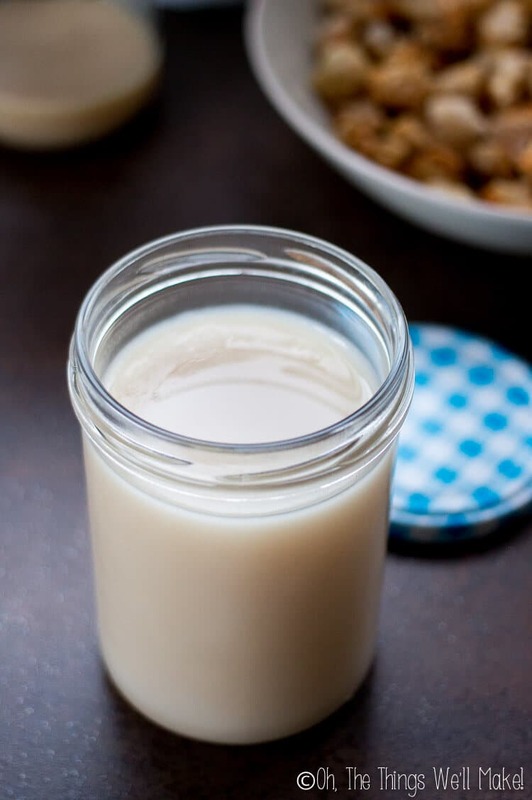 When you render lard, you melt it down and basically remove the water and protein that would cause it to spoil, and you end up with a smooth, white fat that can be used for all sorts of things. Why make your own lard? More and more people are going back to traditional ways of cooking and baking which includes learning how to render fat. 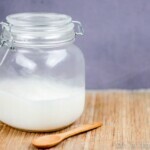 Tallow, rendered from beef fat, and lard, rendered from pork fat, are often used for cooking in gut healing diets like the GAPS diet. Most lard that you buy at the supermarket isn't very good. It is often hydrogenated or has other added ingredients and just doesn't have the same taste or texture. 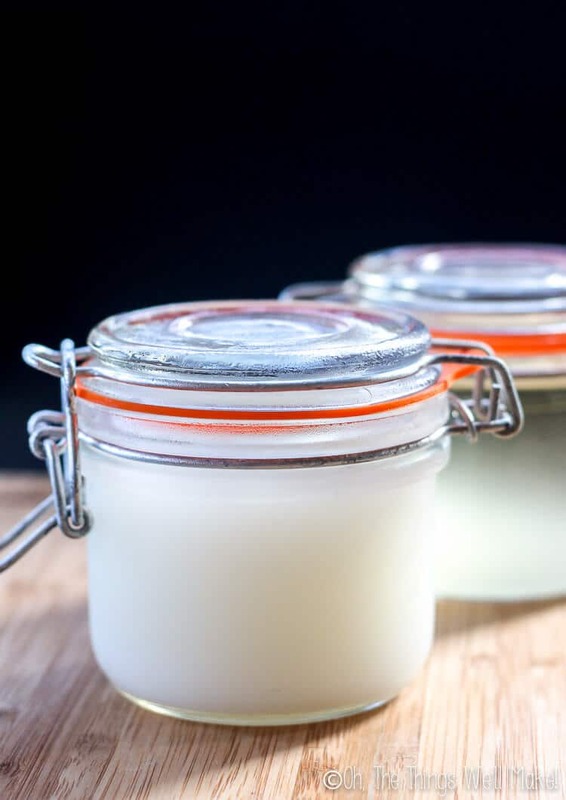 Even if there aren't any other oils or other ingredients, supermarket lard can taste and behave differently because they may use chemicals to bleach or deodorize the lard, or emulsifiers to change the texture. The problem with buying lard is that you don't know anything about the quality of the original fat used to make the lard. Then you don't know what process was used to render and refine those fats. Supermarket lards are usually hydrogenated to help increase their shelf stability, and even allow you to store the lard outside of the fridge. From what I can find about the hydrogenation process, all partially hydrogenated fats will have some trans fats in them, which have been shown to be harmful to us. Fully hydrogenated fats should convert them into saturated fats, which may or may not include trans fats, but may still have other potential problems. No matter what, we are completely changing the composition of the final product. (Plus, what happens with the nickel catalysts mixed into the fats to help hydrogenate them? What, exactly, have we made in the end?) I'd personally rather err on the side of caution, avoid hydrogenated lard, and make my own lard. Is lard healthy? Is lard bad for you? I don't remember a lot from my high school classes anymore, but something my Biology teacher told us really stood out in my mind; so much so that I remember it to this day. He told us that when he was a kid people weren't overweight and sick, despite cooking with fats, using butter, and drinking whole milk. He, of course, attributed it to my generation's lack of exercise. I don't doubt that a lack of exercise plays a role in our increased rate of obesity, but it never made sense to me that a decrease in the amount of exercise was the only reason for the change in the way we look and feel. It wasn't until years later that it started to make sense to me. Maybe it isn't in spite of our reduction in fats that we have gotten more ill and overweight, but rather because of it! Fats have been replaced by sugar which has since been shown to fuel cancer, bring up cholesterol levels, and cause, either directly or indirectly, heart disease and most of the problems that we can develop health-wise. Not only are people finally realizing that a low fat diet isn't as good for you as was once thought, but neither are the supposedly healthier fats (ahem, think margarine and shortening) that we have traded for the traditional fats that our ancestors used. If you actually look at the profile of traditionally made and rendered animal fats, they don't look that bad. Lard has a relatively high percentage of monounsaturated fats. It is around 45% oleic acid, the fatty acid that is supposed to be so good for you in olive oil (70%); compare that to corn oil (27%). 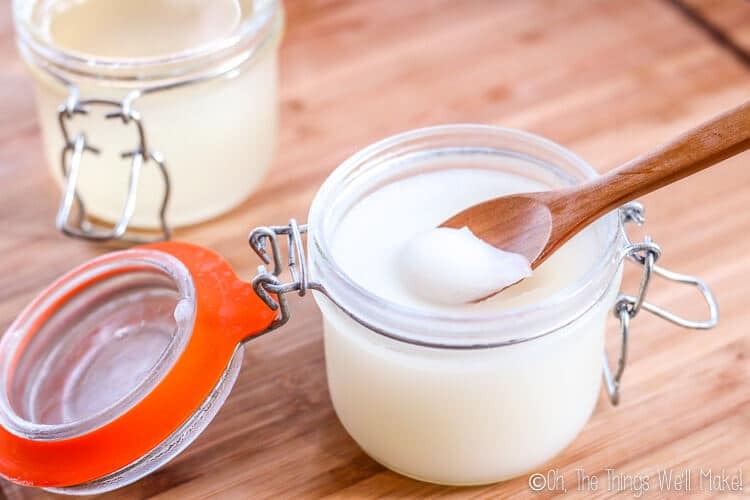 What is supposed to be bad for you in lard, animal fats, and coconut oil is the higher percentage of saturated fats, especially palmitic acid (lard has 26% vs. olive oil with only 13%). It is also higher in stearic acid and myristic acid, but neither of those have ever really been considered harmful for our heart health. Little by little, we are even beginning to realize that saturated fats were likely unfairly demonized. Saturated fats tend to be more stable, which is actually a good thing because unstable oils will create higher levels of free radicals when heated. Even at my last continuing education class, a nutrition course that I took to keep up my dental license several years ago, we were already being advised that coconut oil, despite being so high in saturated fats, was one of the healthiest fats that you can cook with because of its stability at high temperatures. I'm not saying you should now switch your diet and start cooking everything in lard, or that you should adopt a high-fat diet. I think the diet that each of us thrives on is actually quite an individual thing. While I do better on a diet that is slightly higher in fat and much lower in sugar, eating a high-fat diet didn't really allow me to lose weight either. I know of people who have switched to a high-fat diet and have lost a lot of weight. 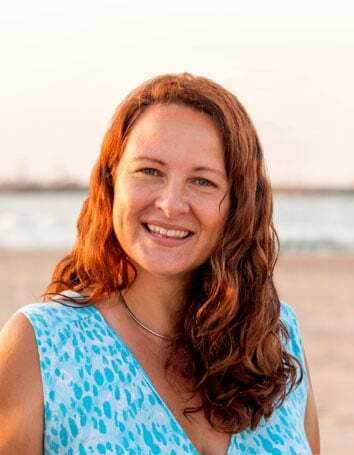 I, on the other hand, found my sweet spot when I began intermittent fasting, eating a lot of vegetables, and while I didn't avoid fats at all, I didn't try to force them into my diet either. Whether you eat a high or low fat diet, I think the important thing is to avoid overdoing anything, and staying away from the more processed foods. I have made the switch to whole milk, vs. skim, fresh pastured eggs (avoiding weird, cholesterol free alternatives), and have switched from cooking with vegetable oils that come from plants that are likely to be genetically modified, like canola oil, to using a variety of other oils and fats. I embrace variety and use extra virgin olive oil and homemade ghee, but also coconut oil and lard. The great thing about cooking in lard is that not only does it make a flaky pie crust, but it also seem to make most foods taste better. I don't want to dedicate more time to my beliefs about what is healthy because I prefer to get to the “how to make lard” part. You can research and come to your own conclusion about what you think is healthiest. Even if you don't want to start incorporating lard into your diet, it's great for making soap. So let's not waste any pork fat, and start making lard. What type of fat should you use to render lard? The flavor of the lard you make depends upon the fat you use to make it. I decided to render lard before trying to make something like tallow because pig fat is very easy for me to find here in Spain. I don't have to ask anybody to specially order it for me, or worry about someone looking at me like I'm crazy for wanting to buy pork fat. I can just go to the supermarket and pick up a tray of what is called “tocino” here, or I can ask for it at any meat counter. Tocino is the “fatback,” or the back skin of a pig with a layer of fat on it. Tocino is readily available because it is used in traditional dishes like Valencian puchero, also known as cocido. Leaf lard, on the other hand, is a more tasteless lard that is often used in making pastries (to avoid ending up with a pork-flavored apple pie). People often think of it as the highest quality lard. To make your own leaf lard, you should render the visceral fat of the pig. This is the fat in the region that surrounds the kidneys. Because I actually like the lard to have it's traditionally slightly pork-like flavor, I don't mind using the fatback for rendering lard. I think it gives great flavor to pan-fried vegetables and fish dishes, and it gives mantecados their traditional flavor. There are a several methods that you can use to render the lard. 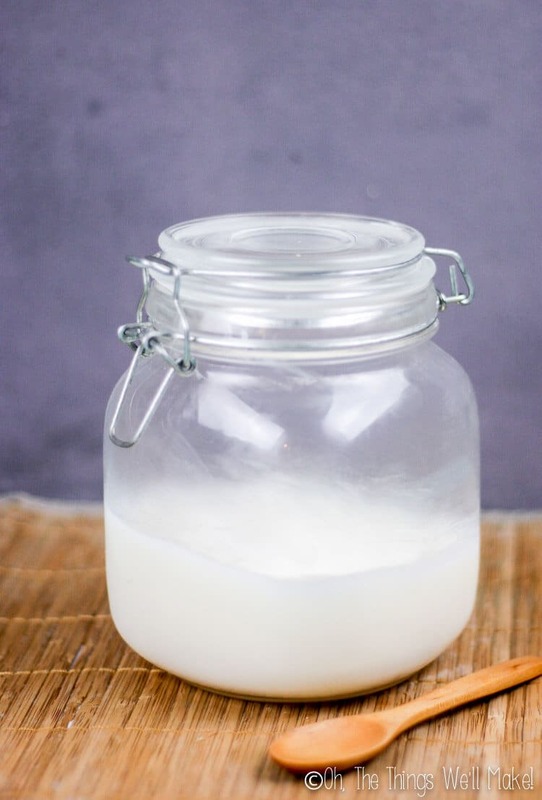 You can make lard with or without adding water. Water is often added to help keep the fat from burning. This is a good idea if you are using higher heat, or if you tend to get distracted and forget you are making it. I've left mine cooking for a bit too long, and the lard wasn't quite as bright white as it normally is. This lard is slightly darker in color because I left the fat cooking too long. The cracklings would have burned had I left them cooking for longer. You can also make lard over the stove or in the crock pot. By now, I have tried all of the different methods of rendering lard, and don't really have much of a preference. If I'm in a hurry or just impatient (which isn't really that unusual), I use the stovetop. If I'm not in a hurry, I find the Crockpot method to be a little less messy. With the low heat of the Crockpot, the fat doesn't spatter all over the place when you lift the lid to ladle off some of the lard. When using the Crock pot method, I never add water because I haven't had problems with the fat burning ever. With the stovetop method, I have tried adding some water to prevent burning, but I don't really find it necessary either. If you want to add water to prevent the fat from burning, don't add a lot because you want it to all evaporate in the process. We are trying to rid the fat of its moisture, remember? If you add water, and it doesn't all evaporate, you will have to find a way of separating out the water in the end. It isn’t difficult to render fat. 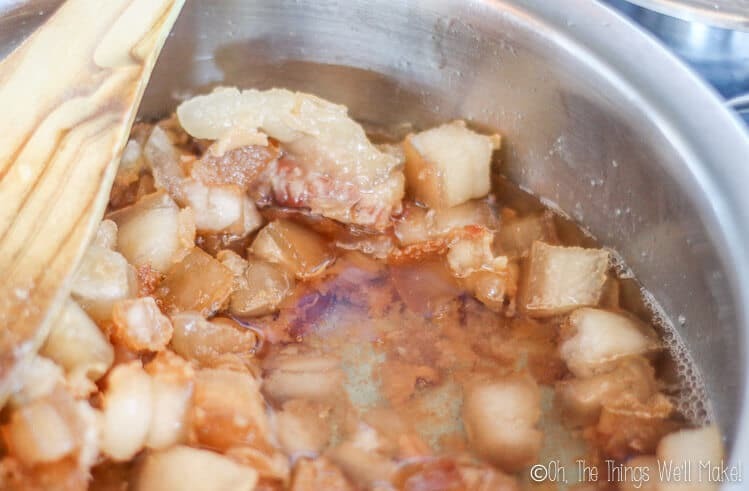 Learn how to make lard easily, either on the stovetop or in a slow cooker. Heat the fat over low heat, stirring occasionally. After a little while, you will start to see a transparent, slightly yellowish liquid forming. That liquid is your rendered lard. 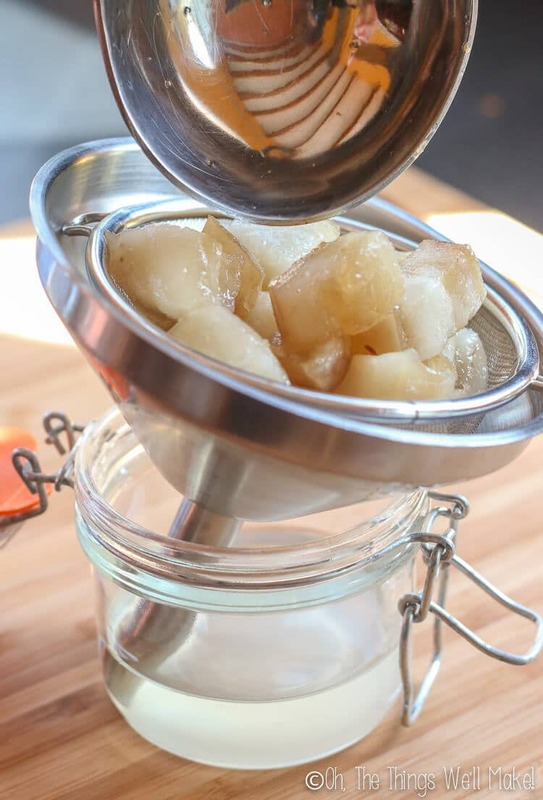 Ladle and strain the liquid lard into a glass storage container. As the yellow liquid starts to cool, it will start to solidify a bit and will get whiter and whiter. 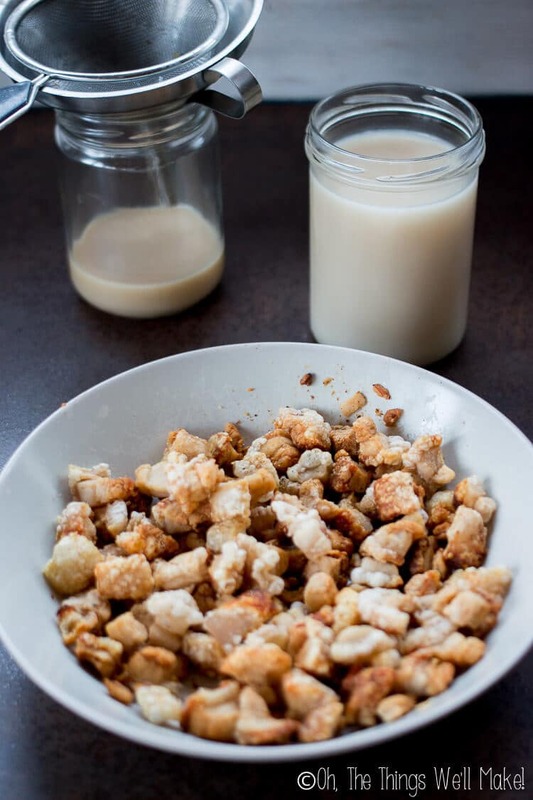 The leftover solid bits, the cracklings, can be baked in the oven and then used to add flavor to dishes or sprinkled on salads (or just eaten alone as a snack). Nutritional information is based on obtaining 1 quart of lard from 1 kg of pork fat. This is all dependent upon the type of fat used. It also includes eating the proportional amount of cracklings (1/64th), and isn't just accounting for the lard itself. 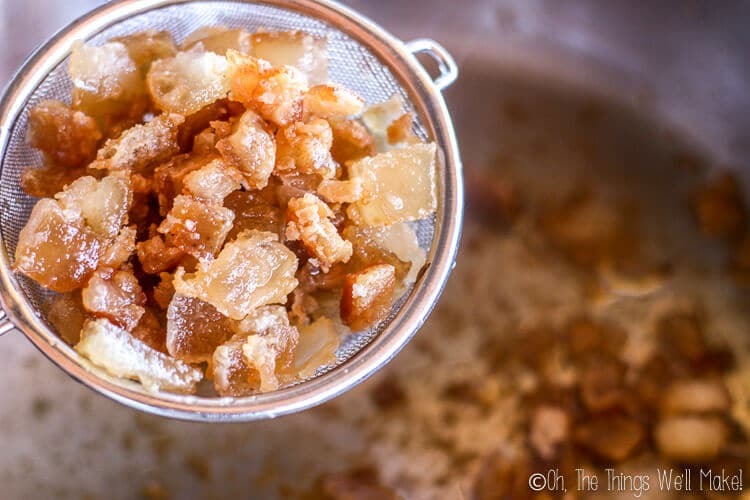 Cracklings are the leftover crunchy bits of meat and skin that are strained out of your home-rendered lard. I normally put the cracklings on a baking sheet and bake them in the oven to melt off any excess fat that remains. I love to snack on the cracklings, but have to admit that I'm not exactly sure why mine come out so differently each time. I have had them come out relatively soft, but I have also had them come out with the skin part as hard as a rock. I can't figure out why I get such different results with the same cut of fat, doing more or less the same thing each time. I imagine it has something to do with the heat used during the rendering process, and how long the cracklings were fried vs. baked. In any case, I have found a way to save the cracklings when they do come out hard. After drying them out more in the oven, I then fry them again in hot, liquid lard. They puff up and turn into pork rinds which are different than the cracklings (I'm not sure why-considering how they are made!! ), but they are also quite tasty. What to do with lard? So, now that we have learned how to make lard, how about we work on making some recipes that use it? I use my homemade lard in my Mexican carnitas, homemade mantecados, and the grain free mantecados. I also used it in my holiday peppermint soap. What is your favorite way to use lard? Hi! I don’t see how long or at what setting you would render the fat in the crockpot! I’d think it would longer than the time on the stove? I used the low setting, but either would probably work fine. You just have to keep a better eye on it at higher temperatures so that it doesn’t burn. I never really time it. Yes, it takes longer if you use a lower heat setting, but it’s also a bit less hands on because you don’t have to watch it as closely. The time will depend on so many things- how small you cut the pieces of fat, the temperature of your stove/crockpot, etc. Well that was interesting! I did a bit of googling and pork belly seems the closest thing to use over here. My mother always used lard for pastry and my grandmother would save dripping from beef, the top of which was very tasty on bread. If I used pork belly would I cut off the meat first? If it’s a really thick piece, you may want to cut it in half first, just to make it more manageable, but it’s not really necessary either! I like to save the fats off of bacon for cooking plates that dont require a flavorless oil. This is mostly the same idea except regular bacon needs more cleaning to come out one consistency. I just strain off the bits of bacon left and pour it into the container. Yum!